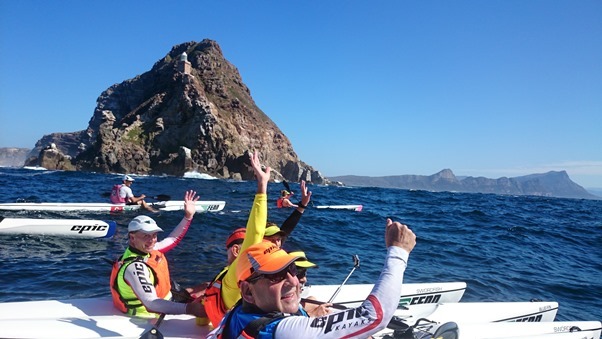 Paddle the Cape of Good Hope with World Champions. Sir Francis Drake described it as “the fairest of them all”, and being the explorer he was, he most certainly knew what he was talking about. Set at the bottom of Africa, this Cape with its towering cliff faces is a fitting crescendo to the symphony of rugged, beautiful and, many times, treacherous coasts that lie to its west and east. It is truly iconic and symbolic not only of its preceding coastlines but also as a gatekeeper to Cape Town and South Africa. To experience the Cape of Good Hope is to experience much of what it means to be South African. Bearing witness to it’s magnificence, it will leave an awe-inspiring picture embedded in your memory and instant adrenaline recall to your emotions. This landmark demands ultimate respect from prospective navigators. The 600 odd shipwrecks that line its shores are a warning to those who would dare be overly confident or perhaps become too familiar. Still, it offers ample opportunity for the intrepid and is a land mass just begging to be explored. Surfski paddle around the Cape! 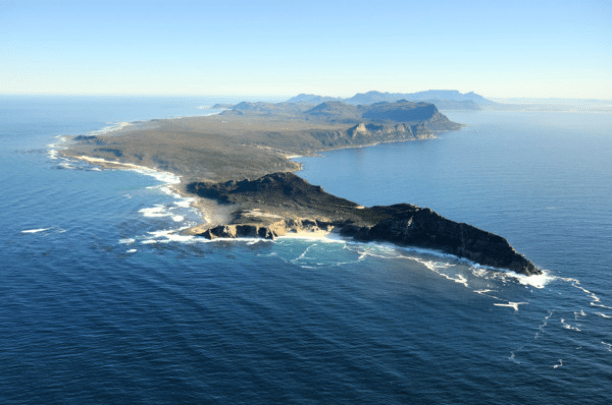 “The Cape of Good Hope is the most majestic and beautiful of them all” said Sir Francis Drake. We can attest to that. There can be no better way to experience the Cape of Good Hope than paddling around it. Formerly only a dream or fantasy of the intrepid few, it is now an option for anyone who has a bent towards adventure and is willing to try something new. The Mocke Paddling team will paddle with you! To paddle the Cape of Good Hope is to join a very select group of individuals. Very few people can lay claim to rounding the Cape purely by physical means, or under “human power”. Apart from a once annual paddling event (the Cape Point Challenge – which has restrictive entry limits) as well as a group of extreme swimmers (also under severe qualification standards), this is not your usual weekend excursion. It requires intimate and detailed knowledge of the coastline, as well as extensive experience in (and of) the ocean, to get around the Cape. Paddling the Cape is for “watermen” only, and of that guard, there can be no better than 4x former World Surfski Series Champion Dawid Mocke. Mocke has spent years paddling along and around the Cape of Good Hope, and has made it his mission to share this experience with any like-minded folk. 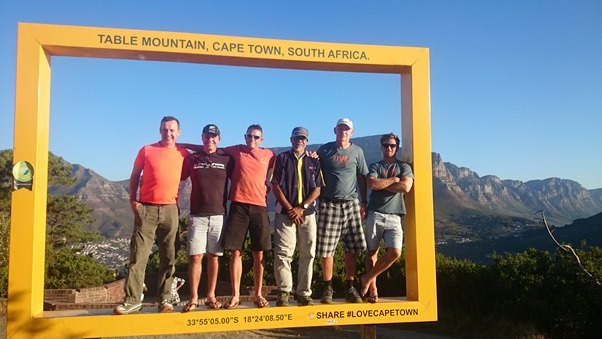 Along with his team of highly experienced paddling coaches, you have the best possible guides and teachers to get you paddling a surfski and then rounding the Cape of Good Hope. Your One Week Paddling Itinerary. You will arrive in Cape Town, one the most beautiful cities in the world, and be taken to your Bed & Breakfast accommodation in the picturesque town of Fish Hoek. For the next four days your hosts, Dawid and the Mocke Paddling team, will get you up and paddling on a surfski and, on the best possible day, you will paddle around the Cape of Good Hope. 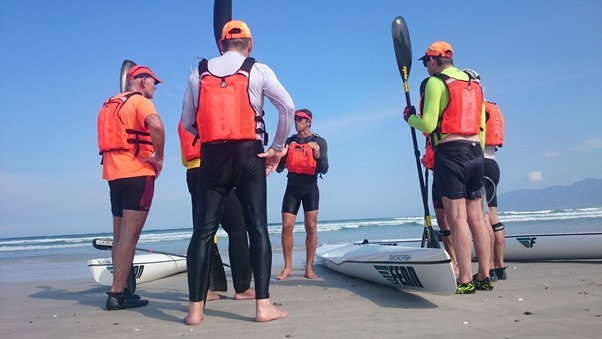 If you are new to surfski paddling, you will spend the first day doing an Introduction to Surfski Paddling and familiarisation of the craft and required skills. For the more experienced surfski paddlers, the 4-day window for rounding the Cape begins as you arrive. The rest of the window period will involve sightseeing, and of course, paddling. Each day will start or finish with some paddling, either in Fish Hoek bay or doing the world famous Millers Run Downwind paddle. While paddling the Cape of Good Hope is your main goal, you will use the rest of your time here to take in all that the greater Cape Town has to offer from climbing Table Mountain, driving the cliffs of Chapman’s Peak and visiting famous landmarks such as the Castle, Robben Island and the Waterfront. Monday: After breakfast meet at the Surfski School, boat allocation, Introductory Session or light paddle, then drive Cape Point Reserve. Tuesday: Day 1 Window for Paddling the Cape, or paddle in Fish Hoek Bay then visit Table Mountain via Chapman’s Peak. Wednesday: Day 2 Window for Paddling the Cape, or paddle along Simonstown coast via Boulder’s Beach & explore the penguin colony and Simonstown. We need a 3 day window period for weather and to do a lesson paddling the surfski. Based on ability and expected weather conditions we also keep the option of paddling in a double surfski, open to clients. There is of course the proviso that conditions are completely unplayable and we are unable to do the paddle. In this case we will just enjoy the sights. Should we be unable to get around the Cape (i.e. we have to call it off because of weather) then we will refund 50% of the price but still have a cool paddle in The Reserve.